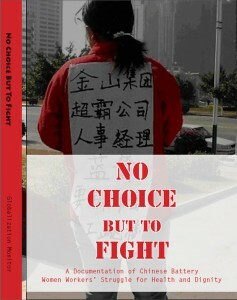 Thanks to Michael Walker who wrote a book review of our publication: No Choice But to Fight. We are glad that we can post his review here. Anyone remotely interested in workers’ rights in the developing world should get this book! Because it is self-published by Globalisation Monitor it does not appear in Amazon and probably few people in the big developing economies have seen it. It is really easy to get a copy – GM sells it for a song or you can simply download it in PDF format off their website. Clearly this is not a book written to make a profit; it’s been written because the story is just so extraordinary and needed to be told. The book describes the appalling neglect of the operators of the Gold Peak battery factory in Huizhou in China’s Pearl River Delta Manufacturing area, whose workers suffer cadmium poisoning after coming into direct contact with the poisonous chemical. The workers largely self-organise to find justice, bypassing the official union and going directly to the authorities and to the press. Only very late in the game do they receive support from groups across the border in Hong Kong. It is all rather tidy: The owners of Gold Peak and their major customers are in Hong Kong, only a few dozen miles away from the factory. I finished the book feeling upbeat for the future of China’s workers. Injustice transcends cultural barriers, and they weren’t going to take it laying down. The site management had poor health and safety controls from the beginning. Rather like big tobacco, they did not respond to it and tried to duck the issue when workers began to realise something was wrong. For a considerable time workers attempted to obtain cadmium blood level tests only to have the results altered or not released at all. At one point the factory owners even go so far as to conspire with local hospital officials to thwart people attempting to have tests from a third party. Not directly relevant but one snippet was a revelation for me and may be for other Western readers: Did you ever wonder how China’s one child policy is enforced? It is done through the employer. The paperwork associated with employment includes family planning permits(!) Anyone who has more than one child suffers demotion or dismissal. This is why people in rural areas are less affected – they don’t work for registered employers, they just work their own land, thus the Central Government has no means of interfering. Astonishingly the mainly female workforce are undeterred by management’s continued ducking and dodging, first striking and then presenting their case to all who will listen including several ministries in Beijing. Their case attracts media attention and thus the assistance of Globalisation Monitor, who organise direct action against Gold Peak and its chairman. While GM’s involvement was helpful I was pleased to see that the most effective action occurs when the company is taken to court (in Mainland China, not Hong Kong) and many of the workers receive compensation settlements. It may not be well known outside the country that China actually has comprehensive health and safety laws – they just don’t have many occupational lawyers! The struggle continues though, with many workers still uncompensated, however I’m heartened that it didn’t endwith them being “rescued” by rich-world NGOs. They are finding their own path. "Just after I put on the face mask given to me by the line supervisor, I saw that my workmate sitting across from me was crying. I was shocked and asked her what was wrong, but she just kept crying and didn’t say a word. Then a workmate nearby told me what had happened. After SARS broke out in 2003, we were each allocated two 3M masks per week by the line supervisor. When this workmate got her mask, she found it was a little too tight and tried to loosen it, but the tie broke. She asked the line supervisor to trade it for another one, but the line supervisor said, “I don’t have any extras. Go ask the general line supervisor for another one.” The general line supervisor was a well-known grouch, so the workmate was afraid to ask for a new mask. Later, the general line supervisor passed by, saw that she had not started her machine and asked why. When the workmate said that the tie to her mask was broken, the general line supervisor yelled at her, “How could you be so careless! Do you realize that these masks cost money? And you think you can just waste them!” The workmate then started crying. I felt bad for her, went over to wipe off her tears, and said, “Don’t cry over this. If you cry, people will look down on you. Let me see if I can take care of it for you.” I went over to the general line supervisor and said, “Ling, would you do me a favor and exchange this for a new one?” The general line supervisor looked at me and said with a sigh, “Look, I can’t do anything about it. You know the higher managers are stingy with the masks – the line supervisors get one mask every four days.” I said, “Well, you shouldn’t be so harsh. We’re all migrant workers here. You don’t have to act so severely.” Later, the general line supervisor went to console the workmate for a while. As for the mask, I came up with a solution – we made a hole in the edge of the mask and strung it together with a piece of elastic." If you have write any about Globalization Monitor, please share with us!